Dream Create Inspire: Paper Makeup Stamps November Release Blog Hop! 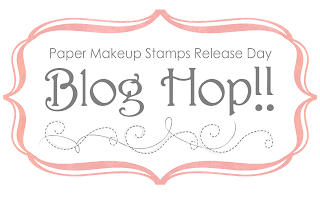 Paper Makeup Stamps November Release Blog Hop! 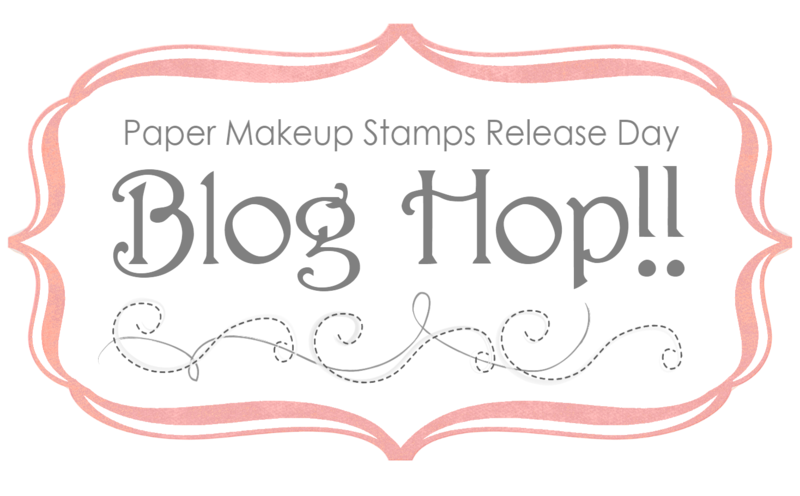 Welcome to the Paper Makeup Stamps October Release Blog Hop!!! You should have arrived at my blog from Ginger's blog, if not, please begin the hop at the Paper Makeup Stamps Blog so you don't miss any of the incredible creations featuring the new November Holiday release! 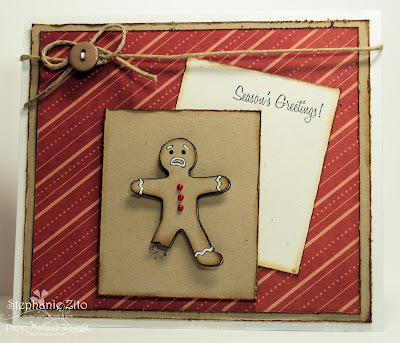 My card for today uses the adorable Gingerbread Man from the new Christmas Cheer set and the Season's Greetings sentiment which is FREE with your new release purchases from PMS this month! Products used on my card: SU cs, LAD dp, Memento and Distress inks, Uniball Signo Pen, Copic Multi-liner, Hemp Twine, Kaiser Pearls, DMC floss and u/k button. Inspiration for my card came from this week's Get Sketchy sketch #63. Collect all the letters throughout the hop to special out a code which will get you 15% off your entire November new release purchase! Make sure you stop in the PMS Forum tonight for the November Release Party starting at 9:00 p.m. EST for some chatting, fun and prizes! See you there! He is SUPER cute! Love that his leg has been bitten heehee! Every time I see this image I giggle! Great card! Super cute! Love the red/kraft color combo. Looks great with the kraft paper. So cute! Great coloring on the cookie.. This is probably my second favorite stamp from this release...I just wish it was sold seperately! LOL! An adorable card, Stephanie! What a darling card! I feel so sorry for that little guy! i love how much dimension you gave him! Good enough to eat! Fabulous job! So cute! Love how the gingerbread man is popped up and the general simplicity of the card. That dp is delish! I love this!! AWWW!!! Poor gingerbread man!! Cute card!! Poor little gingerbread guy! The look on his face is priceless! Love the buttons!! Such a cute card!! Sheesh, I still remember that scene from Shrek! Poor little guy - you have brought the horror back! Great card though Steph! When I see this gingerbread I think of Shrek...Just need to have a few gumdrops come out from behind cause obviously he's a little scared :0). I mean someone ate his leg!! Great card! That poor little guy. Super cute. All I could think was "Oh no!" but it is adorable. Great job on his buttons! Oh my word, how fun! Oh no, not Gingy!!!! :) Great card! What a cute card. It makes me think of Shrek. This is super cute.... love the gingerbread man!